Is there anything sweeter than romance, or more prone to meddling? Lillian (Melissa Miller) and her husband Jack (Todd Bartels) with Jerry (Jonahan Hadary) and his sister Evelyn (Denise Lute) first hear Jerry’s news in “Middle of the Night” by Paddy Chayefsky, directed by Jonathan Silverstein at the Keen Theatre through March 29th. Photo by Carol Rosegg. Family and friends impede on the happiness in the May-December romance at the heart of “Middle of the Night.” Paddy Chayefsky’s play at the Keen Company under Jonathan Silverstein’s direction at Theatre Row through March 29th, is in its first revival since a Broadway run (and national tour) in the mid 1950s. 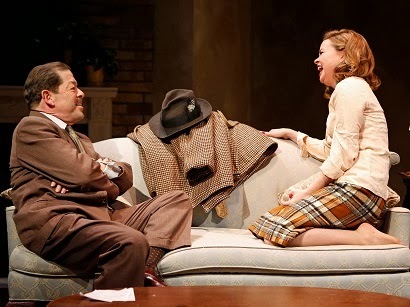 Jerry (Jonahan Hadary) and Betty (Nicole Lowrance) in “Middle of the Night” by Paddy Chayefsky, directed by Jonathan Silverstein at the Keen Theatre through March 29th. Photo by Carol Rosegg. “Middle of the Night” has a fine pedigree, all penned by Chayefsky. It started out as a television for the inaugural show of the seventh season of he Philco Television Playhouse where it starred E.G. Marshall and Eva Marie Saint. It then relocated in 1956 to Broadway where it starred Edward G. Robinson and Gena Rowlands, and went on to star Kim Novak and Frederic March in the Columbia Pictures version in 1959. In “Middle of the Night,” an aging garment Manufacturer, Jerry Kingsley (Jonathan Hadary) is seduced by loneliness and the charms of the Girl from his plant, Betty Preisser (Nicolde Lowrance) into a romance he is not sure is wise. His family, with the exception of his son-in-law, Jack (Todd Bartels) — his stern sister Eveylyn (Denise Lute) and his daughter Lillian (Mellisa Miller)– try to dissuade him from continuing the affair. On Betty’s side the objections are even louder. She is only 24 to his 53, and her mother, Mrs. Mueller (Amelia Campbell) doesn’t understand why Betty would want to divorce her husband, George (Todd Bartells again) in order to marry an old man. Betty’s friend Marilyn (Melissa Miller in the role) is equally puzzled and disapproving. Mrs. Mueller (Amelia Campbell) and Betty (Nicole Lowrance) in “Middle of the Night” directed by Jonathan Silverstein for the Keen through March 29th. Photo by Carol Rosegg. The allure of Paddy Chayefsky’s slice-of-life drama is abundantly on display in this heart-warming Keen production. The cast are splendid, with Jonathan Hadary and Nicole Lowrance in especially fine form. 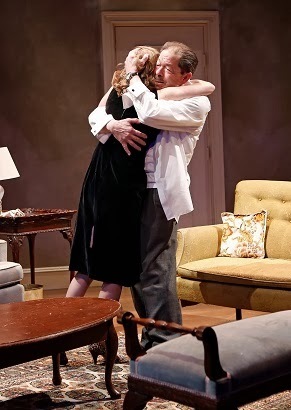 Betty (Nicole Lowrance) and Jerry (Jonathan Hadary) embrace in a scene from Chayefsky’s “Middle of the Night” directed by Jonathan Silverstein for Keen Company at Theatre Row through March 29th. Photo by Carol Rosegg. 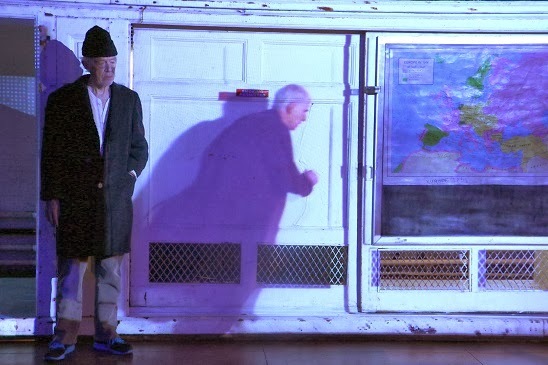 To learn more about “Middle of the Night,” please visit the Keen Company website. 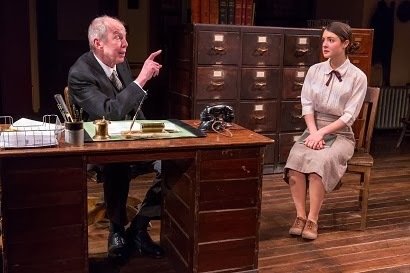 A Day At The Office in "London Wall"
in a Mint Theatre production through March 30th. John Van Druten studied, practiced and even taught law, while enjoying a great success as a playwright, and later screen writer. 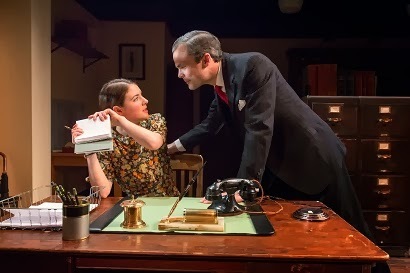 In “London Wall,” The Mint Theatre is reviving one of his earlier gems. 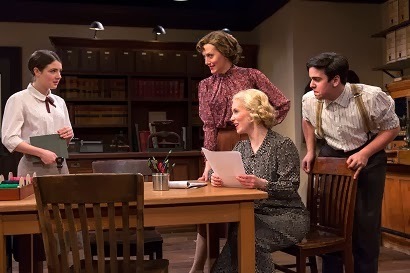 “London Wall,” playing through March 30th, is a naturalistic work, focusing on the economic exigencies of young working women in a busy law practice. “London Wall” sets off to a lethargic start, like Miss Bufton (Katie Gibson) after her lunch break–“I don’t really like being taken out like that in the middle of the day. I’m no good at all for work in the afternoon. I shall probably fall fast asleep over my machine.”–but picks up apace and never lets us nap once it does. 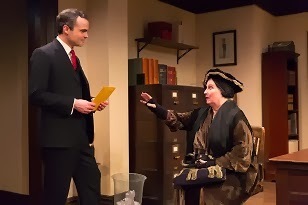 Miss Pat Milligan (Elise Kibler) with Miss Hooper (Alex Trow), Miss Bufton (Katie Gibson, seated) and Birkenshaw (Matthew Gumley) in a scene from “London Wall” at The Mint through March 30th. Photo © Richard Termine. The other typists in the office have less active social lives than Miss Bufton’s. Miss Hooper (Alex Trow) is expecting her boyfriend to a get a divorce from his wife. Miss Janus (Julia Coffey) has spent seven years in courtship with a man in diplomatic service whom she too hopes to marry. Mr. Brewer (Stephen Plunkett) oversees the office, flirting with all the typing pool, but with an eye to woo young Pat Milligan (Elise Kibler.) Their boss, Mr. Walker (Jonathan Hogan) warns Brewer off, finding his behavior towards the women in the office appalling. at the Mint through March 30th. Photo © Richard Termine. With the smirk of a cad, Brewer is outgunned by Miss Janus, who knows a thing or two about affairs of the heart. Blanche Janus is protective of Pat, and dislikes Brewer who is slimy and insinuating. 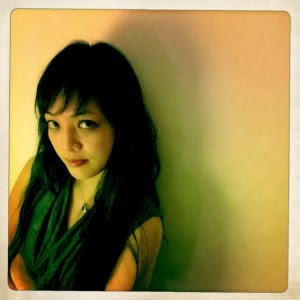 Her interest in Pat and her beau, Hec Hammond (Christopher Sears) is in part nostalgic. “London Wall” at the Mint. Photo © Richard Termine. 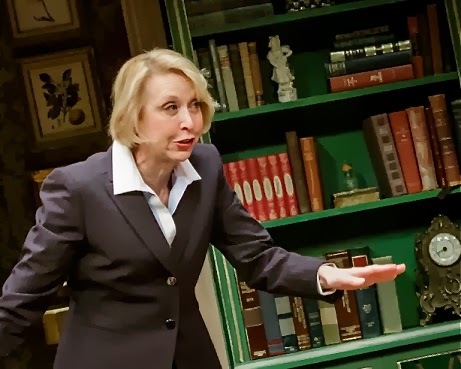 The play depicts office life in all its regular mundanity. The firm of Messers Walker, Windemere & Co. is hectic with the comings and goings of workers and clients. Hec is a visitor from a firm downstairs, frequently borrowing a reference book from the general office, as an excuse to see Pat. 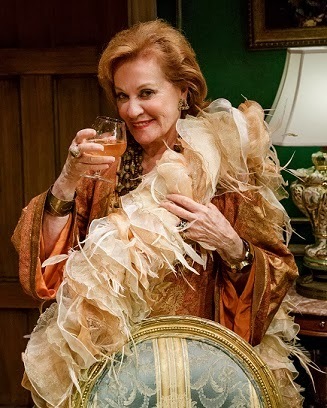 Miss Willesden (Laurie Kennedy) is an eccentric but well-heeled client whom Mr. Walker will no longer see, but whose wills and legal actions are part of the firm’s business. Mr. Brewer attends to her whenever she appears unexpectedly at the offices. “I know office work’s no fun. I don’t always enjoy it myself. There are lots of things I’d rather be doing, and thinking about, but they can’t intrude here,” Mr. Walker says. The office in “London Wall” is a great deal of fun, however. The prolific Davis Mccallum directs this superbly well-coordinated ensemble. 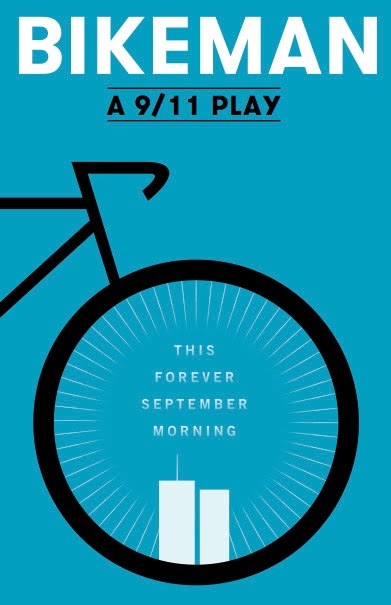 Resident dramaturg Amy Stoller contributes to the little realisms of this excellent and engrossing production. The elaborate sets by Marion Williams engulf the theater space in the office, further emmersing us in the daily life at the law firm in London Wall. Among this outstanding cast, the benevolent Mr. Walker is admirably brought to life by Jonathan Hogan; the dishonorable Brewer is divinely portrayed by Stephen Plunkett; and Miss Pat Milligan as embodied by the newcomer, Elise Kibler, is an intelligent go-getting young woman. Rounding out the cast is the cheeky officeboy, Birkenshaw (Matthew Gumley.) In this group of players, no one should be left off this long list of bests, but we will add one more standout in Julia Coffey who gives Miss Janus a keen and warm understanding. 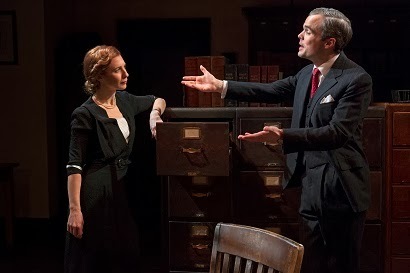 For more about “London Wall,” please visit The Mint Theatre. How well do we know even our closest friends? Domesticity can make for a very dull subject. 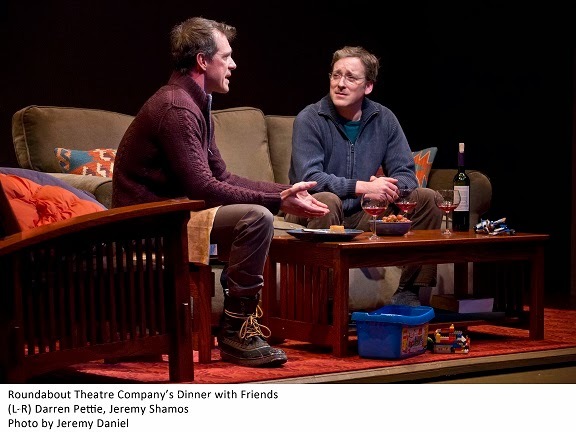 In Donald Marguiles’ Pulitzer Prize winning play, in a Roundabout Theatre Company revival, at Laura Pels Theatre through April 13th,“Dinner With Friends,” it is laced with the spice of infidelity. 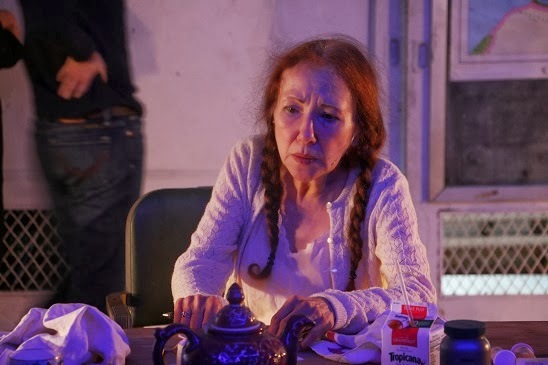 Beth (Heather Burns) spills her misery to her old friend Karen (Marin Hinkle) and her husband’s best friend Gabe (Jeremy Shamos) even before the dessert is served. Tom’s (Darren Pettie) absence from this regular gathering is actually due to his going to see his girlfriend, and not because he is off on another business trip. When his travel plans are snowed out, Tom returns home to discover that Beth told Gabe and Karen that he wanted a divorce. Late as it is, Tom drives over to to set the record straight with Karen and Gabe, who feel betrayed by the dissolution of Beth and Tom’s marriage. Gabe and Karen had fixed Beth and Tom up, spent vacations with them and their kids together over the years. While Beth was clearly blind-sided, they were the last to know. Beth muses, “He was moody. Yes. Distracted. I thought it was work. Or jet lag…” Tom tells Gabe he has never been happier than he has since his marriage ended. He doesn’t want therapy, or need advice. “Dinner With Friends” tells a simple tale of four friends, two couples, each looking to keep passion alive or rekindle it, despite the grind of the day to day domesticity of their lives. As Tom, Darren Pettie manifests an appropriately defensive menace. He is the the bullying poster boy for leaving your wife. When Tom tells Gabe about his new girlfriend, he sounds as if he is proselytizing: “She saved my life, Gabe. She really did; she breathed life back into me ” His enthusiasm for the new is like a slap at the friendship he and Gabe have shared. Jeremy Shamos has the gift of likability that make his Gabe vulnerable and approachable. He is a content with the life he’s chosen: “We’ve all made sacrifices to our kids. It’s the price you pay for having a family,” he tells Tom. 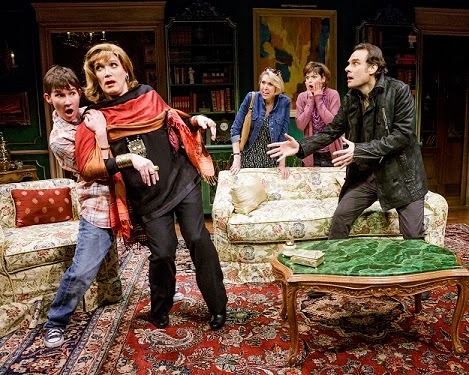 Under Pam MacKinnon’s direction, the ensemble breathes fresh life into this ordinary story. Heather Burns plays Beth as both put-upon and manipulative. The subtlety in her characterization contrasts with Marrin Hinkle’s straightforward portrayal of the judgemental and down-to-earth Beth. 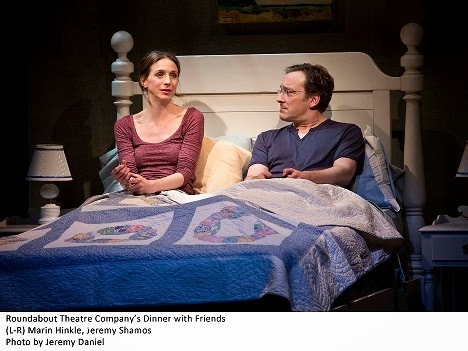 “Dinner With Friends” covers the twelve plus years of marriages and friendships with ease and panache. 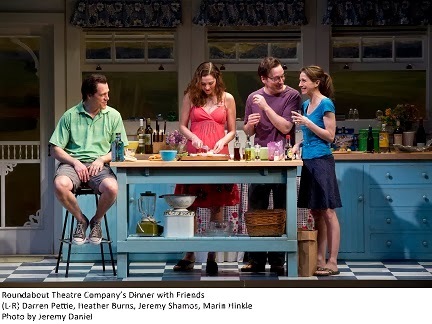 The attractive sets, designed by Allen Moyer, travel through the many locales “Dinner With Friends” inhabits, from Martha’s Vineyard to rooms in the protoganists’ homes. 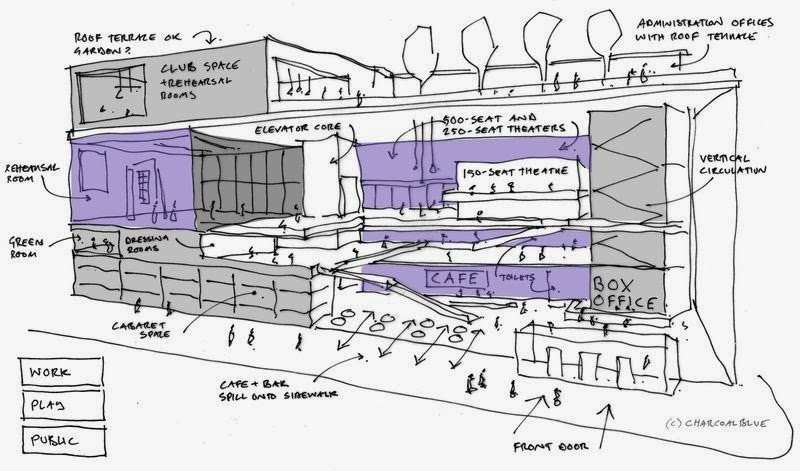 Location, location… It’s a drag! The vagaries of real estate seems such a New Yorker’s obsession. of “The Tribute Artist” © 2014 James Leynse. 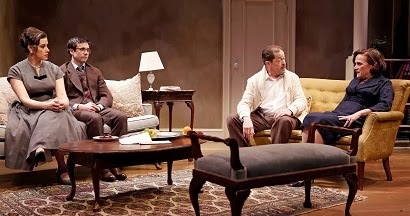 In Charles Busch’s latest ouevre, “The Tribute Artist,” in a Primary Stages production at 59E59 Theaters through March 16th, the real estate is a Greenwich Village townhouse. 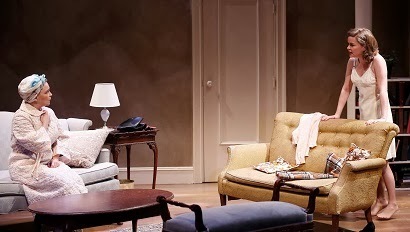 The expansive and elegant set, by Anna Louizos, is a grand and dignified persona. The other characters do not fare as well. The live action is marred by improbability, admittedly often very funny, and a slow pace. Cynthia Harris in the Primary Stages production of “The Tribute Artist” © 2014 James Leynse. Treading the fine lines between drag queen/female impersonator/and down-and out “celebrity tribute” artist, Jimmy (Charles Busch) seizes a foolproof opportunity. Jimmy’s unwarranted optimism lends both fizz and fizzle to playwright Busch’s comedy. His friend, Rita (Julie Halston) joins him in a scheme to impersonate Adriana (Cynthia Harris); Adriana was Jimmy’s landlady in the beautiful old house, who died in her sleep during a night of carrousing with Rita and Jimmy. Halston, a long-time Busch actor and collaborator, and Busch have a natural chemistry and ease. What could go wrong, Jimmy asks? The plot’s twists make for many a merry surprise. Enter Adriana’s niece by marriage, Christina (Mary Bacon) and her transgender daughter, Oliver (formerly Rachel) (Keira Keeley), wth a claim on the property. Oliver, ever the romantic, hunts up an old flame of Adriana’s on Facebook and hence, enter Rodney (Jonathan Walker.) Highlights of the producton include an exit scene Busch has written for Rodney, and the fact that young Oliver-Rachel can curse like a stevedore on steroids. The unrelenting zany in “The Tribute Artist” has some wonderful moments, and some predictible. Don’t fault the cast or director Carl Andress for any lulls in the party; sometimes the zany just falls flat. It’s always a pleasure seeing both sides of Busch– ingenuous actor, inventive playwright. Unfortunately in “The Tribute Artist,” Busch the playwright does not do Charles Busch, the actor, justice. 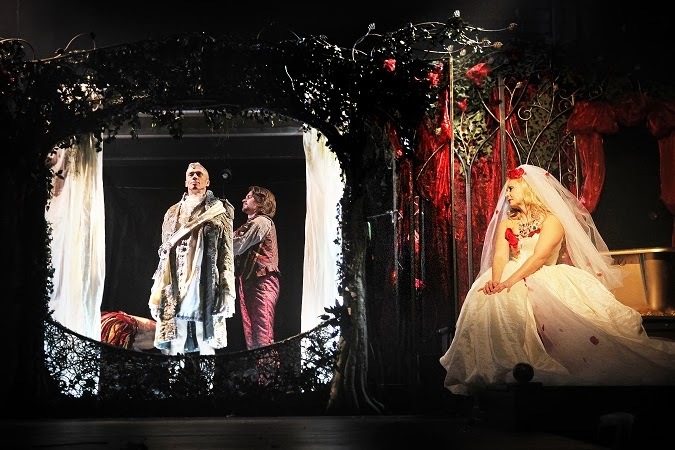 Fairytales make for good theater, because through them we envision a world different from the daily grind. There is magic and mystery. “Beauty and the Beast” is a compelling story in which the beast is misunderstood and opposites attract. In the new production at the Abrons Arts Center, starting March 13th, the Beast is played by Mat Fraser, a well-known disabled actor and performance artist in his native England; Julie Atlas Muz, choreographer, former Miss Coney Island and burlesque artist, is his Beauty. This moving “Beauty and the Beast” is definitely for mature audiences only. Phelm McDermott, founding member of Improbable theater company, directs the live-action, improvisational and puppet pageant. Hear what the director and actors say about the development of “Beauty and the Beast”in this video. Memory not fairytales drives Mallory Catlett’s “This Was The End,” at the Chocolate Factory from February 21s to March 8th. In Chekhov’s play the eponymous Uncle Vanya asks, “What if I live to be 60?” In Catlett’s play, a veteran cast of four, Black-Eyed Susan, Paul Zimet, Jim Himelsbach and Rae C. Wright explore the answer by looking at the manifestations of aging, from memory loss and sleep deprivation to the tolls it takes on the physical being. To find out more about “This Was The End,” and get a small sampling of the show see this and visit http://www.chocolatefactorytheater.org/. Emily Schwend’s “Take Me Back,” at Walkerspace in a Kindling Theatre Company production from February 28th through March 22nd, looks at the American dream through the eyes of a parolee back from a four-year Federal stint. To Bill, living with his diabetic mother, the dream is more like a nightmare. Or perhaps a different kind of fairy tale. To find out more about “Take Me Back,” please visit them at their FB page and go here for tix. Former Czech President, Vaclav Havel’s last work “The Pig, or Vaclav Havel’s Hunt for the Pig,” witten by Havel and Vladimír Morávek, adapted into English by Edward Einhorn, presented at 3-Legged Dog in a Untitled Theater Company #61 production from March 6th through March 29th, combines food, drink, revelry, song and politics. Before the show, Cabaret Metropol, a New York-based ensemble specializing in classic European cabaret music, performs. The production’s “after-party” features a tribute concert of music that inspired the Velvet Revolution, from the Velvet Underground and others, performed by the members of the dynamic cast. Dinner is provided by the Slovakian restaurant Korzo.